Basseterre, St. Kitts -Management and staff of the National Housing Corporation (NHC) have come in for commendations for the sterling efforts they have put in to provide quality and affordable homes to people on St. Kitts. The commendation came from Prime Minister, Dr. Hon. Timothy Harris who was present today (June 14) to hand over the keys to six new homes in the Saddlers-Newton Ground area. 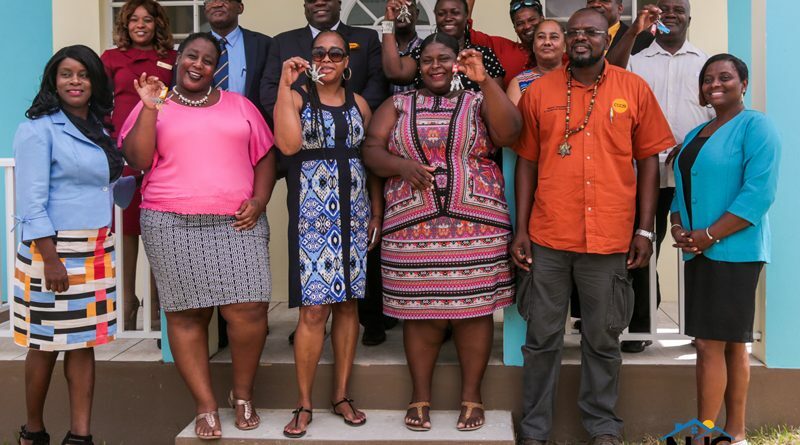 NHC over the last three days presented keys to over 30 newly constructed homes on St. Kitts, and PM Harris, while commending the staff implored them to work more expeditiously to have the remaining houses completed. “…I thank the General Manager, Ms. Simpson-Browne and all the others, the staff who are here for a wonderful job. My only advice: We have to deliver more, we have to deliver them more quickly,” Harris said. Harris and his Team Unity government have been pushing to have more people own homes, as the development of sustainable communities across the federation remains a priority. General Manager at the National Housing Corporation, Elreter Simpson-Browne emphasized that her agency continues to provide affordable houses across the entire island, adding that this morning’s ceremony is a clear indication that Constituency Six is well positioned to receive its quota. Simpson-Browne pointed out that the intention of the Corporation is to make an impact on the lives of residents in every Constituency by ensuring that villages from Newton Ground to Saddlers benefit. “Consequently, in our first year, we have constructed three beautiful houses here in Lavington, and similarly three in Race Course, Newton Ground. I can also say to you that as we are here this morning distributing these houses, contracts have been signed for the construction of houses in St. Paul’s and three in Dieppe Bay,” the GM Said. She reminded that three other persons in the constituency have been aided by the NHC’s assistance programme. Eugene Hamilton, Minister of Housing, Health and Human Settlement, called upon citizens and residents to take their lifestyle and health seriously. He urged persons to be mindful of their personal finances as far too many people are undertaking hire purchase, which equates to higher interest rather than opting for loans. Calvin Leader, Director of the Board of NHC told the gathering that it is a great occasion for the Housing Corporation as it highlights that the agency is providing greater efficiency by raising standards and assisting those who are economically challenged. Officials at the National Housing Corporation are constructing 300 homes across St. Kitts. The development has seen NHC upgrading the Garden Housing Development and assisting indigent persons. The construction of the houses forms part of a $50 million loan from Social Security.